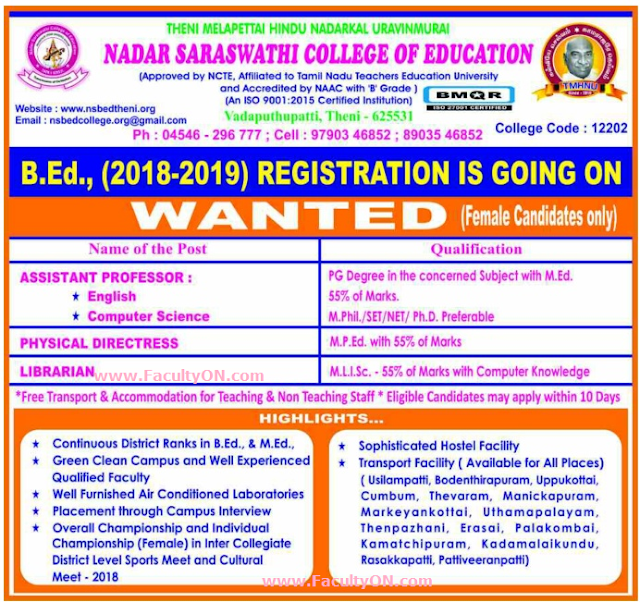 Nadar Saraswathi College of Education Theni has advertised in the DINAMALAR newspaper for recruitment of Assistant Professor Jobs Plus Non-Faculty jobs vacancies. Interested and eligible job aspirants are requested to apply within 10 days from 13th May 2018. Check out further more details below. About College: The prestigious team of Theni Melapettai Hindu Nadar Uravinmurai had Started the NADAR SARASWATHI COLLEGE OF EDUCATION in 2005 with 88 students.College is embedded in the Scenic Beauty. It is located at Vadapudupatti 6 km away from Theni. It is a Self-Finance College approved by NCTE Bangalore and affiliated to Tamilnadu Teacher Education University,Chennai which offers 10 Major Subjects for B.Ed Course.